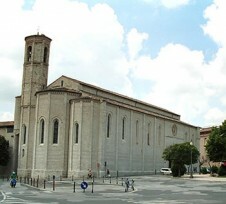 The St. Francis church is a work of architect Fra'Bevignate and is situated on the same site where, previously, the residence of the Spadalongas was. The latter were some friends of Francesco, who offered him hospitality when he left his father's house. The church, the only one of the city with one central nave and two lateral ones, was constructed in the second half of XIII century. The octagonal pillars support the vault, situated at the same height of the three naves. The vaults andcapitals result from a restoration in the XVIII century. At the inside of the church, in the left chapel, threre are frescoes of particular interest: the "History of the Virgin" By Ottaviano Nelli (around to the 1400); Madonna with Child, S. Cristoforo, S. Antonio Abbate and other paintings of XV the century in the right nail head. Currently the curch hosts the Communal Pinacotheca.